The houses along the quiet tree-lined street look just like the normal homes found all across the Rwandan capital. But behind the walls of the three adjoining villas in Kigali are the headquarters of a global operation involving investigators and prosecutors who are working to track down the very worst killers of Rwanda's 1994 genocide. Inside, French investigators have come to talk to witnesses and to gather evidence. A Norwegian team is also on site. 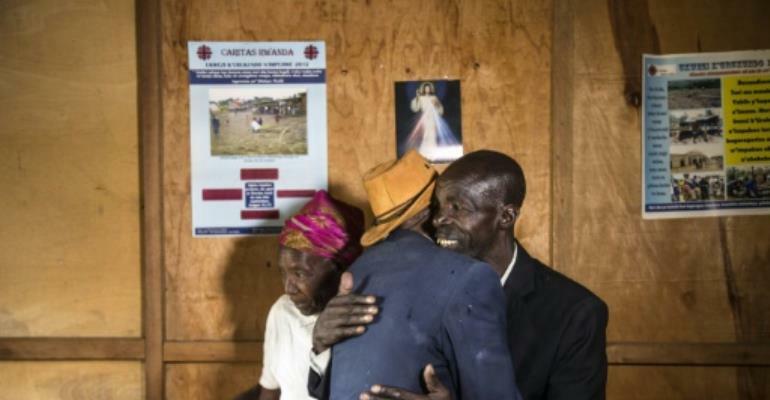 All are supported by Rwanda's Genocide Fugitive Tracking Unit (GFTU), a special team created in 2007 to prosecute the architects behind the slaughter of some 800,000 mostly Tutsi victims. "The mandate was to investigate and compile case files for the fugitives who were still at large," said Faustin Nkusi, spokesman for the National Public Prosecution Authority, which oversees the unit. After the bloodshed, many perpetrators escaped. Some were arrested and taken to the UN-backed International Criminal Tribunal for Rwanda (ICTR), based in Tanzania. That court closed in 2015 after several dozen convictions. For many of those who carried out the killings, justice has been at a local level through community tribunals known as "gacaca" courts. Between 2005 and 2012, these courts put nearly two million people on trial, with some two-thirds of cases resulting in a conviction. But the search for justice continues. 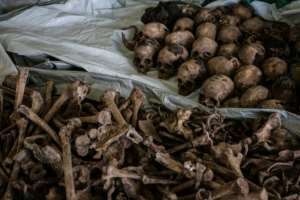 A quarter of a century after the genocide, Rwanda is as determined as ever to make sure the key suspects are arrested and put on trial over the killings. Many are still at large, scattered all over the world. The GFTU has issued 1,012 international arrest warrants for suspects in 32 countries. Several are in neighbouring nations like Democratic Republic of Congo, Uganda and Tanzania. Others are further afield in places like Kenya, Malawi and Zambia. And still others fled to Europe, North America or even Australia. Key suspects on the run include Felicien Kabuga, once one of Rwanda's richest men who is accused of financing the genocide, who was reportedly spotted in Kenya. Another is Augustin Bizimana, a former defence minister believed to be hiding in DR Congo. The team is having an impact: 19 people who were allegedly involved in plotting the genocide have been arrested and returned to Rwanda for trial, while 22 others have been tried abroad. But this is only a drop in the ocean. When the gacaca process closed in 2012, the courts handed the GFTU a list of nearly 72,000 fugitives who had been sentenced in absentia. And tracking down all those people along with other remaining suspects is tough. "It's not easy," Nkusi said. "We don't have the upper hand in investigating and arresting. We have to work together with other institutions from those countries." The GFTU team, which involves both investigators and prosecutors, works with teams across the world, including their judicial counterparts in countries where suspects are hiding. It also works with UN experts and the international policing agency, Interpol. Investigators face many challenges: by now, suspects have grown much older and have had years to perfect their changed identity as well as to slip across borders. Some have obtained political asylum. After Rwanda abolished the death penalty in 2007, countries were encouraged to send suspects home. In recent years, suspects have been extradited from United States, Canada and The Netherlands. Other nations, however, argue that they do not have extradition treaties with Rwanda while also demonstrating a reluctance to try suspects themselves. "We wish they would be brought back to the country, to the scene of crime," said Nkusi, but pointed out that some countries were "not politically willing to do that". France, which denies Kigali's accusations of supporting the Hutu regime that planned the genocide, has refused multiple requests from Rwanda to extradite suspects. So far, only one former Rwandan army officer and two mayors have been sentenced in France. "They have an obligation to judge these people," said Nkusi. With Rwanda set this month to mark a quarter of a century since the genocide, Nkusi hopes the speed of extraditions will increase. "Justice has to be done," Nkusi said. "People have to be arrested. People have to be tried -- to either be found innocent or be convicted."